The last week has been very busy. The next week coming up will be even busier for me. So I have decided to have a series of short, random posts focused on a picture taken in the last few weeks. Awhile back, I tried to cook too much rice in a too small a pan, resulting in burnt, yet uncooked rice. Not a smell I wanted permeating through our house. So I left the entire pan outside overnight to cool. The next morning I saw this snail, apparently eating the rice. 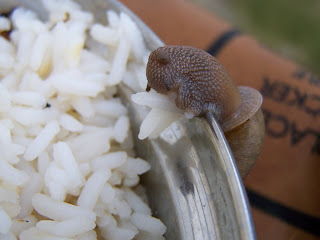 What an amazing photo - that is one happy rice filled snail!! I don't think I have ever looked at snail in such detail! That is such a cool photo! !